Try this delicious recipe by Omar Allibhoy for a great meat-free alternative to traditional turkey at Christmas. 1. Preheat the oven to 170˚C, gas mark 3. With a small, sharp knife, carefully score a border 1cm from the inside edge of the aubergines, then scoop out the insides with a spoon. Dice the scooped-out aubergine. 2. Next, make the pisto. Place a large frying pan over a high heat and add the olive oil and onion. Fry for 1 minute, then add the red pepper. After a couple of minutes, add the garlic and 1 minute after that, the diced aubergine and courgette. 3. Once the vegetables start to turn golden and caramelise, add the tomato, sugar, spices and a good pinch of salt. Sauté for a couple more minutes, then take off the heat and stir through the tarragon. 4. 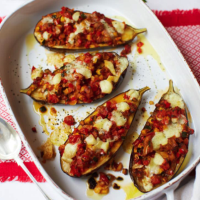 Season the aubergine cases with a little salt, then fill them with the pisto. Place on an oven tray lined with baking parchment and bake for 30 minutes. Scatter with the chopped manchego and bake for another 10 minutes. Allow to cool for 5 minutes before serving.